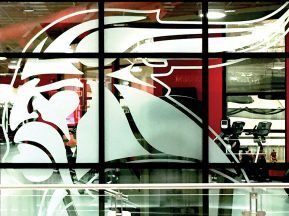 Princeton City Schools built a new high school and were seeking to showcase an important sculptural piece in the entry of their new building. Collaboration between ASI and some key partners resulted in them successfully achieving and in fact exceeding the expectations of the school. 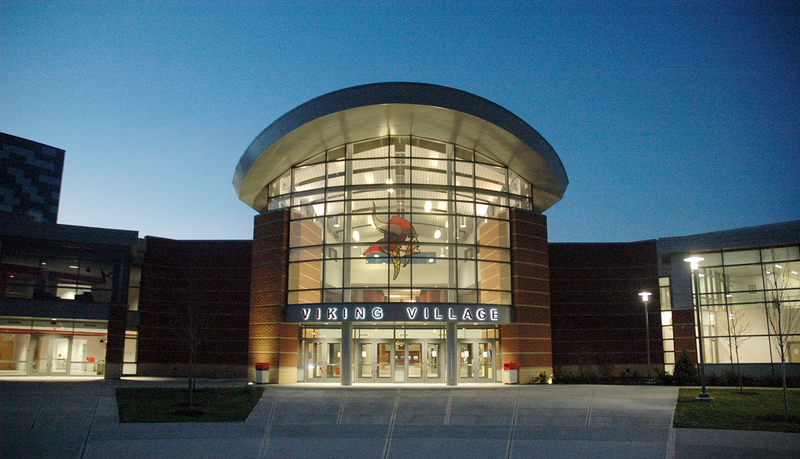 Princeton City School Board had a vision of featuring an impressive, inspirational sculpture which would create a memorable first impression for anybody, whether student, faculty or visitor, when entering the building. It was important to the school that the sculpture would embody its character and spirit. Budgetary considerations were also very important. While they had a vision they were also cognizant of the reality of cost. 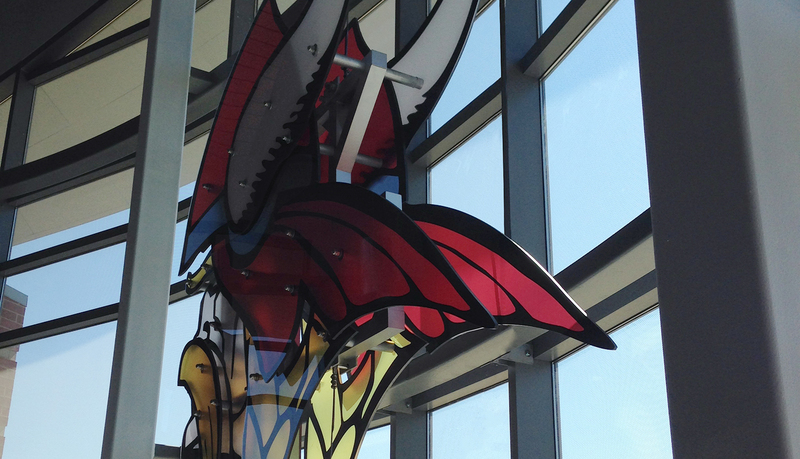 CR architecture+design was engaged by the school to conceptualize and create a design for the sculpture. 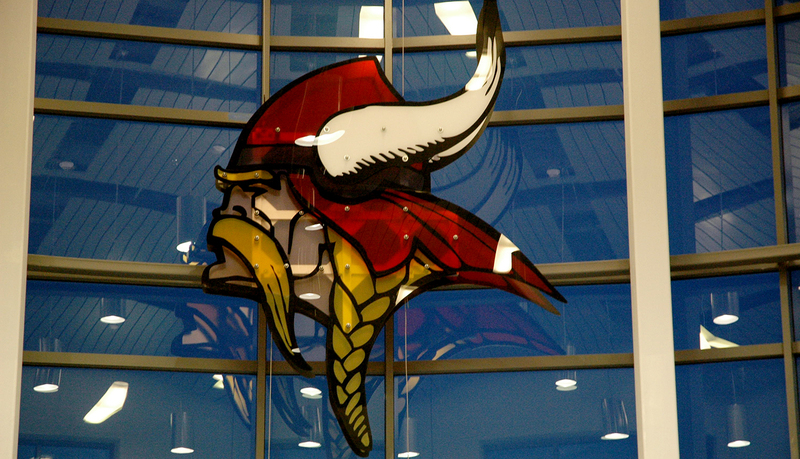 They designed a large sculpture of a Viking head, representing the school’s Viking mascot. CR envisioned that the sculpture would be manufactured using 3form material. 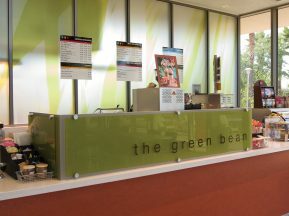 The design included layered translucent colored panels to be suspended from the ceiling inside the main glass atrium. The entire structure was planned to measure 14 ft. 6 in. high by 10 ft. 7 in. wide, and would have a 2 ft. depth. ASI, Cincinnati was brought into the picture to execute the impressive vision. However, there were some initial challenges of the design to overcome. Firstly, the 3form material was too costly given the facility’s budgetary constraints so an alternative material was recommended. Secondly, consideration needed to be given to how the numerous layers of this 1,000 lbs sculpture would connect to each other and the ceiling above. It would be challenging to find an engineer to assist in the design of attachments that would ensure complete structural integrity while still maintaining the essence of the original design intent. 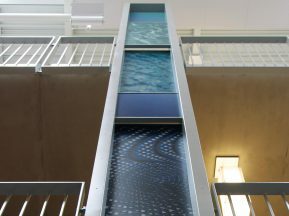 Diligence by ASI staff resulted in them working with Aaron Biedenbach of EnCon Services and the end result of the collaboration was a solution that involved mounting the entire sculpture in such a way that makes it appear to “float” in the atrium space. 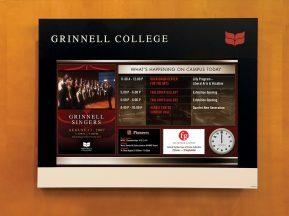 The solution involved using 14 pieces of digitally printed half-inch thick acrylic, which ensured that each piece still had color translucency. 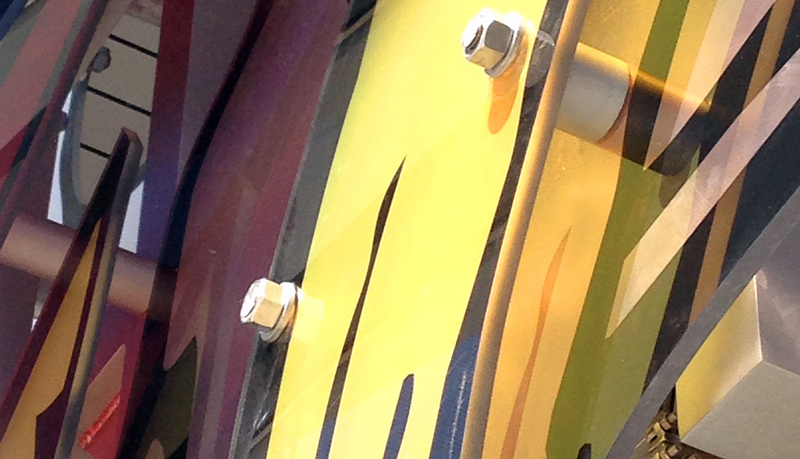 The pieces were mounted with rods and 2-inch-thick spacers between the acrylic panels. 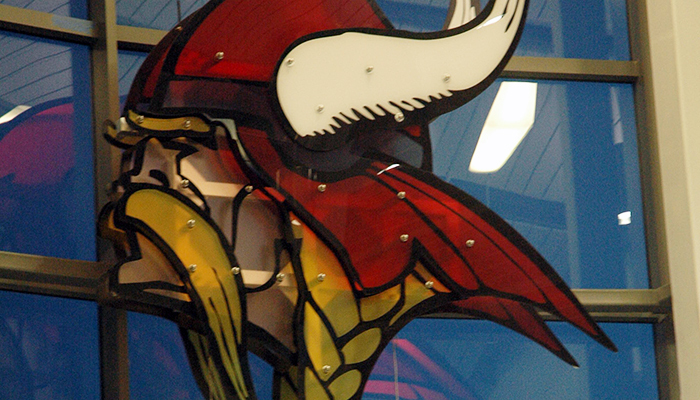 Cables from the ceiling to the structural shelf below secured the sculpture in such a way that it created the illusion of the Viking mascot being suspended in mid-air.